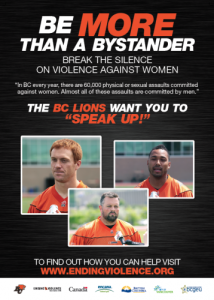 BC Lions players deliver the Be More Than a Bystander program to 433 students at Elphinstone Secondary in Gibsons, BC. BC Lions players deliver the Be More Than a Bystander program to 277 students at Pemberton Secondary in Pemberton, BC. BC Lions players deliver the Be More Than a Bystander program to 482 students at Don Ross Middle in Squamish, BC. Retired BC Lions player and Be More Than A Bystander spokesperson JR LaRose delivers an Indigenous Be More Than A Bystander presentation t0 Weiwaikum First Nation. Contact Victim Services and Crime Prevention for more information. BC Lions players deliver the Be More Than a Bystander program to students at Clayton Heights Secondary in Surrey, BC. BC Lions players deliver the Be More Than a Bystander program to 165 students at Burnaby Mountain Secondary in Burnaby, BC. BC Lions players deliver the Be More Than a Bystander program to students at Aldergrove Community Secondary in Langely, BC. BC Lions players deliver the Be More Than a Bystander program to students at Fraser Heights Secondary in Surrey, BC. BC Lions players deliver the Be More Than a Bystander program to students at Alberni District Secondary School in Port Alberni, BC.